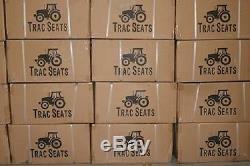 TRAC BRAND TRACTOR SEATS are very sturdy heavy duty steel constructed vinyl seats. Our seats have more universal mounting holes than other leading brands. Trac Brand Tractor and Utility seats are made to withstand the toughest of terrains as you work your farm, land or construction site. Our seats are tested to assure top quality and durability. One would be surprised the difference it makes when riding on your Tractor or Utility that is not the proper width, height or suspension. This can make for a long day on the job. Our seats are designed with the proper height, width and suspension you need to have a comfortable ride. 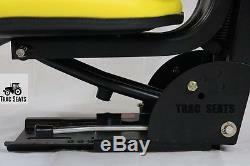 Trac brand seats has the quality, sturdiness and comfortable suspension you want. We believe our seat is the best on the market and know you will appreciate this great product. It is a high quality seat. 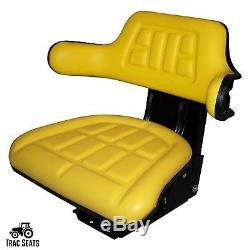 Not all seats that look similar to Trac Seats have suspension or proper suspension. Our suspension system along with a nice padded seat and back rest is what gives you a comfortable ride. If you ride a seat that does not have the proper suspension. You will not be satisfied. Not to mention, your body will not appreciate it either. 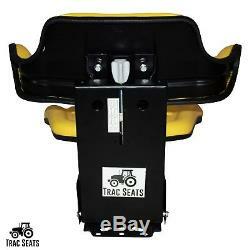 What are the features of a Trac Brand Tractor Seat? Heavy Duty Molded Steel Frame. Adjustable Fore and Aft Slide Track Position. Full Adjustable Suspension (Comfort Ride). 2 Piece Self Draining Seat Cushions. User weight up to 275 pounds. This seat is compatible to all the following. What if my holes do not line up? See pictures for mounting pattern. Although our seats have more mounting options than any other seats this style. Sometimes you may still need to drill holes for it to mount to your tractor. If you need to, this is not a big task. Just line it up, mark it, drill and mount. 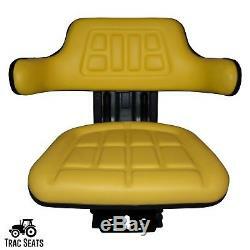 Trac Brand Tractor Seats is truly a universal seat. 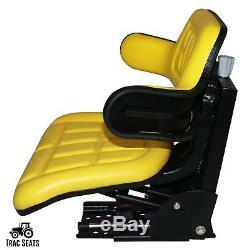 Are Trac Seats easy to assemble? Very simple 3 piece system. Heavy duty steel frame, back rest and seat. 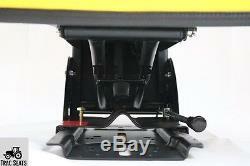 Attach the seat to the heavy duty steel frame and tighten. 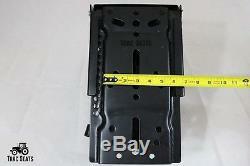 Next attach back rest to the upper part of the heavy duty steel frame and tighten bolts. 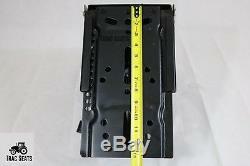 Now you are ready to attach to your tractor or utility. It only takes us a few minutes to process, pull, label your order and update your account. Will my seat look like the picture? We do not use stock photos. We take our own pictures of the actual product. When you place your order. We do not want you to have any surprises. You deserve to receive exactly what you ordered. The item "YELLOW JOHN DEERE 5200 5210 5300 5310 WAFFLE STYLE TRACTOR SUSPENSION SEAT" is in sale since Tuesday, April 4, 2017. This item is in the category "Business & Industrial\Heavy Equipment, Parts & Attachments\Heavy Equipment Parts & Accessories\Tractor Parts". The seller is "tracseats" and is located in Killen, Alabama. This item can be shipped to United States, Canada, United Kingdom, Denmark, Romania, Slovakia, Bulgaria, Czech republic, Finland, Hungary, Latvia, Lithuania, Malta, Estonia, Australia, Greece, Portugal, Cyprus, Slovenia, Japan, China, Sweden, South Korea, Indonesia, Taiwan, South africa, Thailand, Belgium, France, Hong Kong, Ireland, Netherlands, Poland, Spain, Italy, Germany, Austria, Israel, Mexico, New Zealand, Philippines, Singapore, Switzerland, Norway, Saudi arabia, Ukraine, United arab emirates, Qatar, Kuwait, Bahrain, Croatia, Malaysia, Brazil, Chile, Colombia, Costa rica, Dominican republic, Panama, Trinidad and tobago, Guatemala, El salvador, Honduras, Jamaica, Antigua and barbuda, Aruba, Belize, Dominica, Grenada, Saint kitts and nevis, Saint lucia, Montserrat, Turks and caicos islands, Barbados, Bangladesh, Bermuda, Brunei darussalam, Bolivia, Ecuador, Egypt, French guiana, Guernsey, Gibraltar, Guadeloupe, Iceland, Jersey, Jordan, Cambodia, Cayman islands, Liechtenstein, Sri lanka, Luxembourg, Monaco, Macao, Martinique, Maldives, Nicaragua, Oman, Peru, Pakistan, Paraguay, Reunion.